SHRI GURU RAM RAI PUBLIC SCHOOL, DEOBAND is run by Shri Guru Ram Rai Education Mission, Dehradun has been started in 1995 in a smaller building, but now it is situated at Lalwala Road close to S.D.M. Court in a spacious building. The foundation of the school was laid on the request of the people of Deoband as there was no any other school that could provide English Education in such an easy way. Today this school is running very successfully and smoothly. It provides cheap and best education through English Medium. This school encourages to the poor and rural people to get the education of C.B.S.E. standard and higher education through English medium. It is not only the right of some exclusive class but this school at Deoband has realized the dream of poor people also. 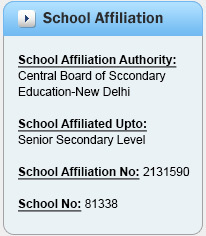 As the poor middle class people can get their ward admitted to this school at very nominal charges.